Supply chain management is a well-developed area. The traditional supply chains are dynamic systems which include the forward and reverse flows of physical products and the related information and fund. However, a service supply chain is different because the real "product" may take the form of a "service" which implies that many traditionally crucial decisions in supply chain management such as product shipping problems are no longer important. Here, a service supply chain is defined as a supply network that transfers resources into services or servitised products, with or without physical products, to satisfy customer needs. As a result, managing a service supply chain system requires innovative strategies with new models. Currently, there is an absence of a comprehensive reference source that provides the state-of-the-art findings on this important topic. It will thus be significant to develop a well-balanced edited volume that includes both theoretical results (from different perspectives) and application cases/studies on service supply chain systems. 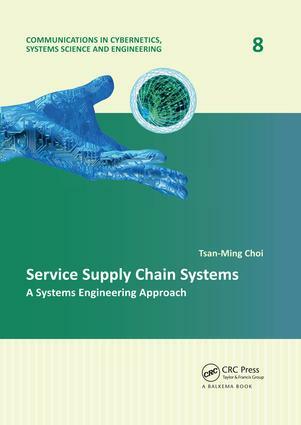 This book is a pioneering text on service supply chain systems. It features papers which adopt the systems engineering approach in conducting service supply chain analysis. It includes both theoretical results (from different perspectives) and application cases/studies on service supply chain systems. It will be a good reference book for industrialists and academics who are interested in the service industry, service operations, service management, and service sciences. "This is a pioneering book in the area of service supply chain systems by using a system engineering approach. Scholars, students, practioners all can learn how to manage service supply chain after reading this book. Thus, this book is great reference book for people who are interested in the service operations management." Prof. Bin Shen, Assistant Professor in the department of Electronic Commerce and Logistics, Donghua University, China. "Tsan-Ming Choi has emerged as a leading figure in Service Supply Chain research. This book adds to his earlier work, he has collected works from scientists around the world, looking at service supply chains from many different, some very original, perspectives. We find inputs on classical (in normal supply chains) subjects such as coordination, management accounting, power structures and resilience, but also more unique subjects such as the use of signs as services and the relationship to big data in services. In addition, there are several chapters purely about, or related to, applications. Readers used to supply chain research, but unfamiliar with service supply chains may find the applied chapters very useful to really grasp the peculiarity of supply chains without physical products, or services attached to, but different from, the physical products they service. This is a good book to have for those of us who teach logistics or supply chains as a means to find examples of service supply chains and what makes them different from other supply chains." Professor Stein W. Wallace, professor of operational research at the Norwegian School of Economics, Bergen, Norway. Dr. Tsan-Ming Choi (Jason) is currently a Professor in Fashion Business at The Hong Kong Polytechnic University and has been active as an Associate Professor at The Hong Kong Polytechnic University until June 2014. Over the past few years, he has actively participated in a variety of research projects on supply chain management and applied optimization. He has authored/edited ten books and guest-edited twelve special issues for various leading journals on related topics, and has published over 100 papers in peer-refereed academic journals such as Annals of Operations Research, Automatica, Computers and Operations Research, Decision Support Systems, European Journal of Operational Research, IEEE Transactions on Automatic Control, IEEE Transactions on Automation Science and Engineering, IEEE Transactions on Industrial Informatics, IEEE Transactions on Systems, Man, and Cybernetics (Parts A, B, C; Systems), International Journal of Production Economics, International Journal of Production Research, Journal of the Operational Research Society, Omega, Production and Operations Management, Service Science (INFORMS Journal), Supply Chain Management, Textile Research Journal, Tourism Management, Transportation Research, etc. He is currently an area editor/associate editor/guest editor of Annals of Operations Research, Asia-Pacific Journal of Operational Research, Decision Sciences, Decision Support Systems, European Management Journal, IEEE Transactions on Systems, Man, and Cybernetics - Systems, Information Sciences, Journal of Fashion Marketing and Management, Journal of the Operational Research Society, Production and Operations Management, and various other operations management and information systems journals. He is also an executive committee member of professional organizations such as IEEE-SMC (HK) and POMS (HK). He received the President's Award for Excellent Achievement of The Hong Kong Polytechnic University in November, 2008 (the most prestigious award for a faculty member at the university level). He is a member of various internationally renowned professional organizations such as IEEE, INFORMS, ITAA, and POMS. Communications in Cybernetics, Systems Science and Engineering is a cross-disciplinary book series devoted to theoretical and applied research contributions to cybernetics, systems science and engineering. The series aims to publish the highest quality monographs and edited volumes on the most recent advances and innovative applications in the relevant areas of investigation, catering to a rapidly growing worldwide interest in a cybernetic and systemic methodology with an ever-increasing capacity to deal with new challenges in a way that traditional science cannot. The CCSSE series aims to become a comprehensive theoretical, practical, international, multi- and interdisciplinary database of, reference work on and guide to issues in these fields of research and the strategies required for better implementation in the context of environmental protection and sustainable social and economic development. Communications in Cybernetics, Systems Science and Engineering aims at all working in the theoretical and applied fields of cybernetics, systems science and engineering, e.g. academics, researchers and consultants in cybernetics and systems, computer and information scientists, development and systems engineers, mathematicians, librarians, management cyberneticists and systemists, medical scientists, educators, and intelligent and manufacturing engineers in industry. It will also be of interest to leading decision- and policy-makers. 2) All areas of systems engineering and the spectrum of engineering activity, decision-making, management of products and services, and processes of all types. Focused on comprehensive approaches to practical applications and developments of "hard" and "soft" systems and cybernetic methodologies, including, but not limited to: Cognitive ergonomics • Conceptual architecture • Configuration management during system development • Decision-making • Environmental policy • Human-machine interaction • Identification of user requirements and technological specifications • Integration of new systems with legacy systems • Integrated product and process development • Issue formulation analysis and modeling • Modeling of uncertainty, maintenance over an extended lifecycle and re-engineering of systems • Multicriteria decision-making • Numerical simulation and qualitative modeling of complex systems • Risk assessment and safety • Sustainable development • System identification, operational test and evaluation • Systems analysis, engineering processes and methods such as optimization, modeling and simulation • Trade-off of design concepts.